High energy conservation and emission reduction (ECER) requirements across industries in the Beijing–Tianjin–Hebei (BTH) region have been proposed along with the transformation of China’s economic development mode. However, the energy consumption rebound effect, as an important proxy for achieving sustainable low-carbon development, has not been adequately investigated across industrial enterprises in this area. 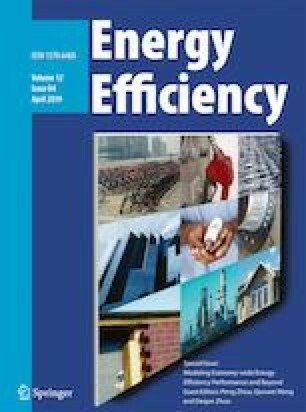 This study adopts an alternative estimation model based on neoclassical economic theory to measure the energy rebound effect of industrial enterprises in the BTH region from 1996 to 2015. Four main results are obtained. First, the energy rebound effects in Beijing, Tianjin, and Hebei are significantly different in the temporal and spatial dimensions. Second, technological progress does not reduce energy consumption, and the local government must simultaneously consider technological progress, industrial structure, and policy formulation to achieve the ECER goals. Third, ECER policies combined with government administrative measures do not have an impact on reducing energy consumption. Fourth, in the process of implementing the integration development of the BTH region, Hebei faces greater pressure to attain ECER goals in the future than the other regions. This study provides suggestions based on these derived results from the perspectives of market-oriented measures, management factors, development mode, and regional cooperation to achieve the sustainable development of the BTH region. The authors are much indebted to Professor Yi-Ming Wei for his constructive suggestions provided at the seminar in Beijing Institute of Technology. This research is partially supported by the National Natural Science Foundation of China under the grant nos. 71501139, 91746110, 71372019, 91746208, 71521002, and 71642004; the National Science Fund of China for Distinguished Young Scholars under the grant no. 71625003; the National Basic Research Program of China (973 Program); the Special Items Fund of Beijing Municipal Commission of Education; Natural Science Funds of Jiangsu Province (No. BK20150307). Den, Q., Jin, Y., Rao, P. (2015). The Beijing-Tianjin-Hebei Synergy Development Program Outline was approved. http://politics.people.com.cn, (2015/0501), c1001–26935006.